There are many instances when we forget to attach the file in the email and remember it after hitting the send the button. I usually end up in such situation when I forget to attach the important attachment in the important email. There is a free powertoy called “Missing Attachment Powertoy” that will remind a Outlook 2007 user of potential missing attachment. 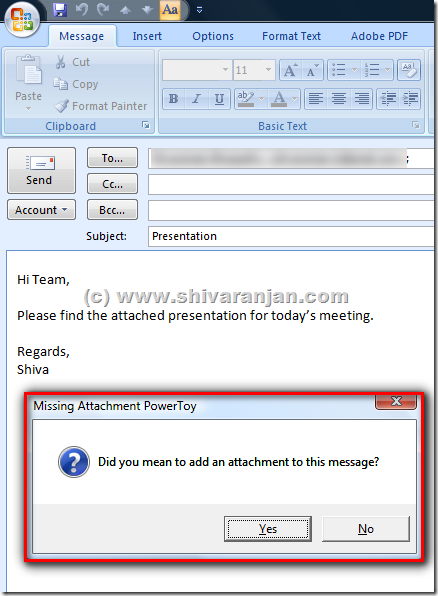 When Missing Attachment PowerToy detects an e-mail message containing words which you typically use when including attachments, it will remind to edit the email before Outlook 2007 can send. In below screenshot you can see that in the body of the email attachment is mentioned but no attachment file is attached. Notice how Missing Attachment Powertoy reminds about the missing attachment. This powertoy sadly works only with Outlook 2007 and older Outlook editions are not supported. If you use Outlook 2007 then this tools is a must have for you.